What can I say about this series that hasn't already been said?! Illuminae was incredibly hyped when it was released, but I wasn't interested in reading it because science fiction isn't my favorite genre. But I finally gave in to my curiosity last year and tried it when the audiobook went on sale. Y'all, I'm obsessed! 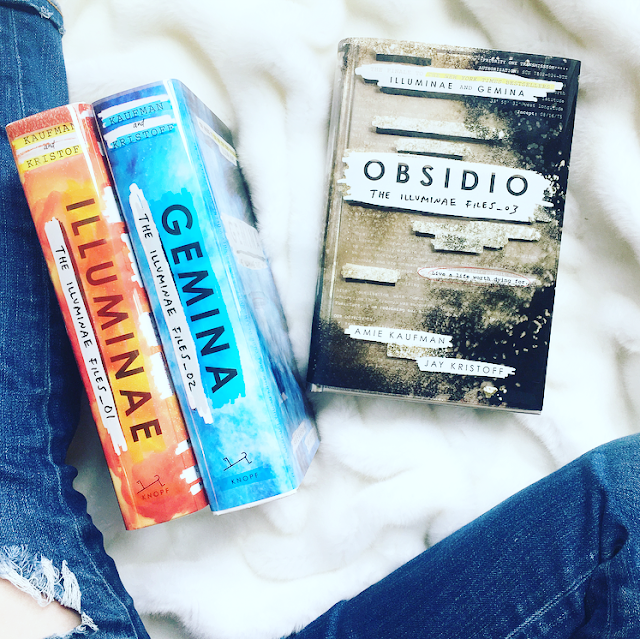 I've already reviewed Illuminae and Gemina, so I won't spend too much time talking about them. But I've got to reiterate that love for just a second because I just finished re-reading them both, only nine months after my first read. You know I think a story is excellent if I read it twice in a year! From the format of the physical book to the production of the audio, it's an immersive experience that is unlike anything else I've read! I couldn't wait to get my hands on the last book, though I dreaded the mayhem that I knew would ensue in their fight for justice. That's what prompted me to re-listen to the audios, even though they were still pretty fresh in my mind. I couldn't resist any opportunity to spend more with these characters. And honestly, the second time was even better! Once I was done with my re-read, I was ready for Obsidio. Well, I was mentally ready... emotionally, not so much. As with the first two books, I listened to the audio but frequently referenced my physical copy so that I could look at the charts, drawings, and other things that make these books so unique. Y'all, these audiobooks are not to be missed! I love the full cast and can say with certainty that the audio added so much to my reading experience. I won't spoil anything about the story, but it lived up to all of my expectations. I really liked the new characters introduced and adored seeing everyone interact together. I love these talented, quick-thinking teenagers and their fight to be heard and remembered! Additionally, I liked that some of the conflict in this book involved the teens not being taken seriously by adult authority figures. It was interesting to see how they were underestimated and ignored – despite how they'd proven themselves in the first two books. They're fighting for justice, but they also have to fight to be heard. To prove that their voices and opinions matter. It's frustrating to see them ignored and belitted... but man, it's so amazing when they prove their worth. You wouldn't think a space war would leave time for romance, but you would be wrong. There's some majorly swoonworthy moments in here! I loved that the romantic declarations felt earned. The high-stakes conflict made everything feel more emotionally significant. When you know life can end at any moment, you know you can't waste a moment of it. There were several times I skipped backwards on my audio so that I could re-listen to a particularly poignant moment or conversation. FEELS. My only issue with the series worth mentioning? There's a significant amount of cursing, thought it's muted out in the audio and censored in the physical copy (your mind will probably fill in the blanks). However, the Lord's name is frequently taken in vain, something that's particularly noticeable on audio. It absolutely bothered me, so just be forewarned. I love this little band of badasses. And I'm honestly in awe of the way Kaufman and Kristoff take three different relationships (basically six protagonists) and three different conflicts and weave them into an overarching fight for justice that's cohesive, gripping and dynamic. Overall, the conclusion was so satisfying! As expected, it was an emotional rollercoaster. I'm still not sure I've recovered! I predict many re-reads of this series in my future, and I can't wait to find new things to love each and every time. If you've been hesitant based on the hype or the genre, I hope my experience will convince you to give these books a shot! I have a feeling they'll surprise you. Oh yes, the language in this one! It bothered me too — I get that characters in books say stuff I might not like, that’s realistic — it’s there, but I can just move on with things. But it was just SO excessive in this book it started to just feel lazy to me — like couldn’t the authors come up with ANYTHING else, even sometimes, for them to say in those high stress moments?! It took me out of the story, to be honest, and is a big reason I didn’t read on past book 1. P.S. It’s just as excessively noticeable in the print edition!